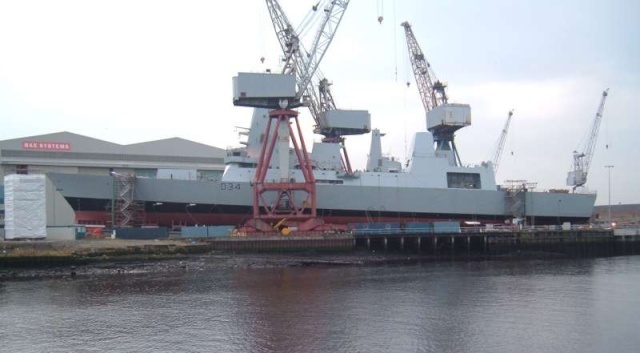 Le destroyer lance-missiles HMS Daring a été lancé le 1er février aux chantiers BEA Systems de Scotsound, sur la Clyde. Le navire a été baptisé par la comtesse de Wessex devant 11.000 personnes avant de glisser sur sa rampe de lancement. Premier d’une série de 8 navires, le HMS Daring entrera en service en 2009. Cette série, qui devait comprendre initialement 12 unités, est amenée à remplacer les destroyers des classes Sheffield et Manchester. Longs de 152 mètres pour un déplacement de 7300 tonnes en charge, les T45 sont conçus pour assurer la défense aérienne de zone. Ils seront équipés des radars de veille Sampson et S 1850 M. Après avoir travaillé sur le projet tripartite Horizon avec la France et l’Italie, la Grande-Bretagne s’est finalement retirée en avril 1999, maintenant toutefois sa participation pour le système d’armes. Londres, Paris et Rome ont donc développé ensemble le Principal Anti Air Missile System (PAAMS) pour les T45, les Horizon et les Orrizonte. 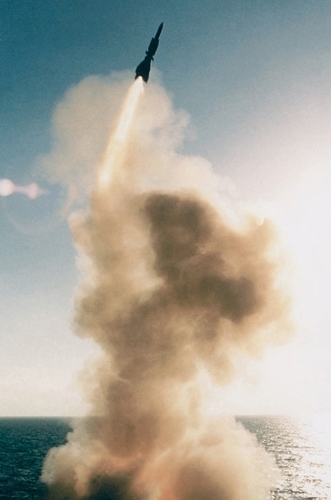 Ce système comprend 6 lanceurs octuples Sylver A 50, dotés de 32 missiles Aster 30 et 16 missiles Aster 15. Capables de filer 29 nœuds, les nouveaux destroyers de la Royal Navy seront les premiers à mettre en œuvre les turbines à gaz WR 21. D’une puissance de 20 MW, ces machines, étudiées par Rolls-Royce, Northrop-Grumman et DCN, sont spécialement conçues pour réaliser des économies d’énergie. « La récupération de la chaleur aux échappements permet d’augmenter la puissance disponible et de réduire la consommation de combustible et la signature infrarouge », précise Bernard Prézelin, auteur de Flottes de Combat. DCN Propulsion, près de Nantes, est chargé de la partie française du projet. L’établissement, qui a également livré les réfrigérants eau de mer/eau douce des sous-marins britannique de classe Astute, sera engagé cette année dans une nouvelle campagne d'essais sur les groupes turbo alternateurs des T45. 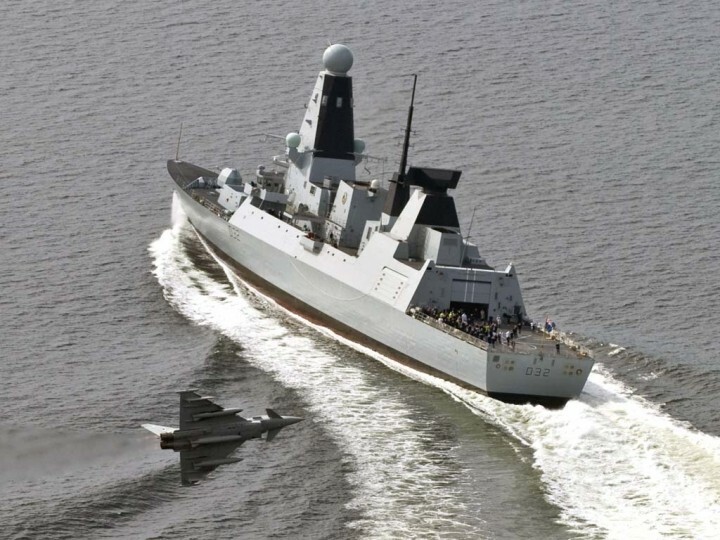 Après le Daring en 2009, la Royal Navy doit toucher les Dauntless et Diamond en 2010, le Dragon en 2011, le Defender en 2012 et le Duncan en 2013. Les deux derniers ne sont pas encore nommés. A noter que les chantiers de VT Group, à Portsmouth, participent à la construction de la proue, ainsi que des mâts et des cheminées, qui sont transférés par barge jusqu’à Scotsound. Remplaceront le type 42. Issus du programme tripartite Horizon, abandonné par la Grande-Bretagne en 1999. Douze unités étaient prévues mais le chiffre a été ramené à huit en 2004. 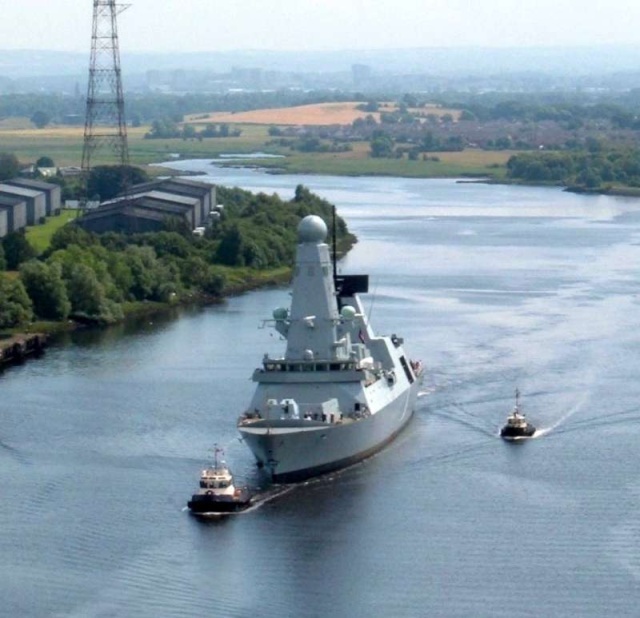 Coût estimé des six premiers destroyers : 5,8 milliards de Livres..
HMS Daring (D 32) : The first of the Royal Navy's Type 45 destroyers making her way downriver from the BAe yard at Scotstoun in Glasgow and approaching Erskine Bridge at the beginning of a month's sea trials - 18th July 2007 during the past 6 months. The 7,500 tonne vessel will remain under the control of her builders, BAE Systems Surface Ship Solutions, during this trials phase, which is expected to last for about four weeks. During this period her builders will trial the ship’s innovative all-electric propulsion system, and her manoeuvring and navigational systems to ensure the ship is seaworthy and safe to sail on the high seas. Her main 4.5in calibre gun will also be fired using inert shells on the Benbecula range, not to test its accuracy, but to test the loads it places on the structure of the ship. 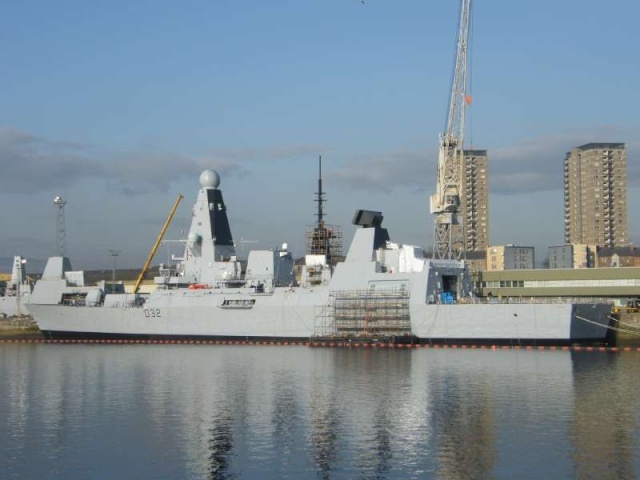 The Senior Naval Officer on board the ship, Commander Dave Shutts, said: “This is a great day for everybody who has been involved in the Type 45 Destroyer project since its inception in 2000. It is the first time Daring has moved and steered under her own power. Daring is the first all-electric ship in the fleet and uses two powerful Rolls Royce fuel-efficient gas turbines, backed with two diesel generators to produce 40 Megawatts of power. This is supplied to huge electric motors that can drive the ship at up to 29 knots. The ship’s hull and superstructure employs radical “stealth” shaping to reduce her radar echo in order to make her more difficult to attack. Her combat system, which will be tested during exhaustive trials next year, is centred on the immensely sophisticated Principal Anti Air Missile System, which equips the ship to protect itself and other ships from attack by a range of advanced missiles. 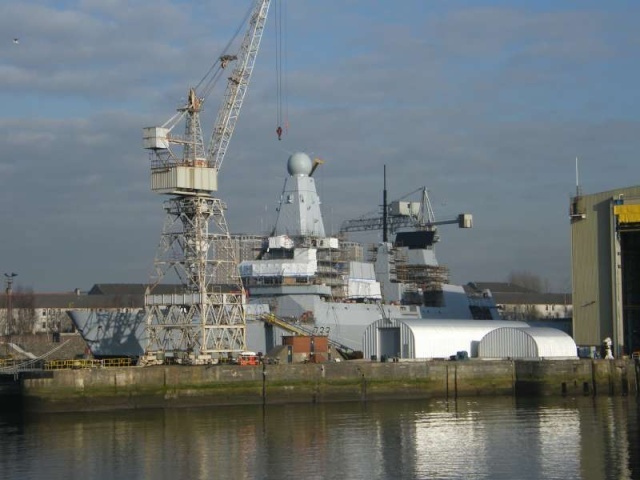 Le HMS Daring (D 32) durant sa construction. HMS Daring (D 32) seen at her builders on the Clyde at Glasgow on the 26th September 2007. Trials barge Longbow in Portsmouth on 29th October 2007. 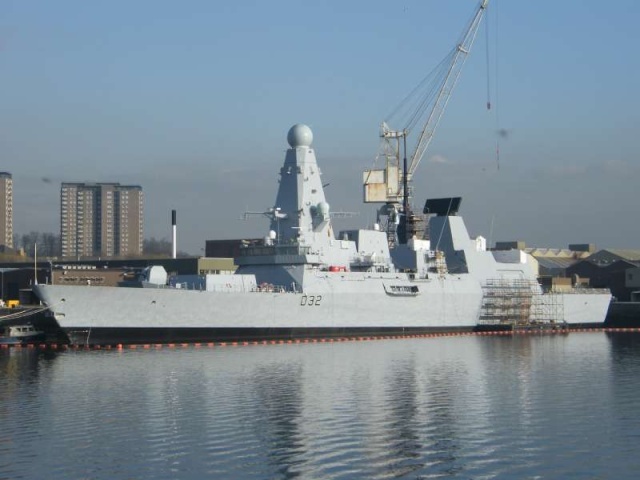 She was constructed to support the Principal Anti Air Missile System (PAAMS(S)) programme developed for the next-generation Type 45 Destroyers. 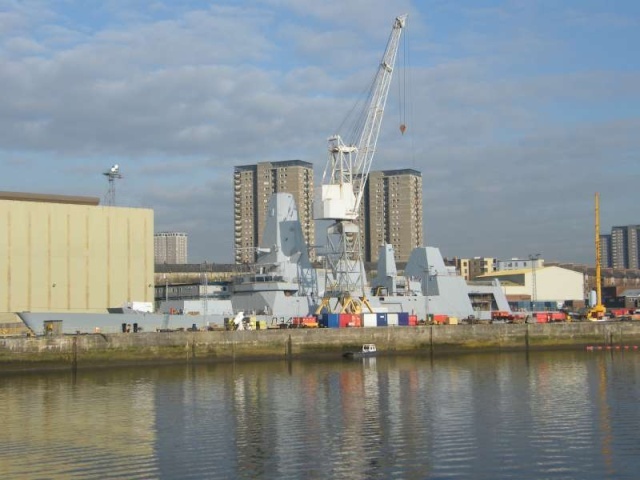 HMS Diamond (D 34) : The third of the Royal Navy's Type 45 destroyers at the BAe Systems yard in Glasgow. Over 14000 tickets have been issued for entry to the yard for the launch on November 27th, 2007. 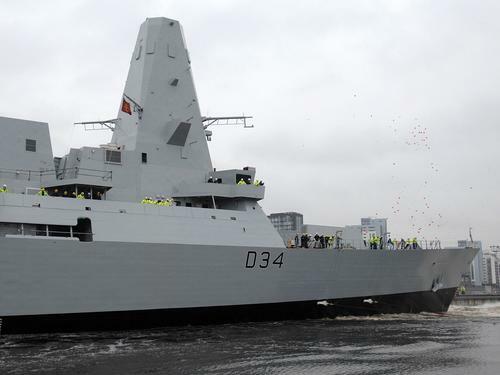 The Royal Navy’s newest and most powerful Type 45 destroyer - Diamond - was today launched from BAE’s shipyard at Govan, on the Clyde. Several thousand members of the public attended the launch, including over three thousand local school children. 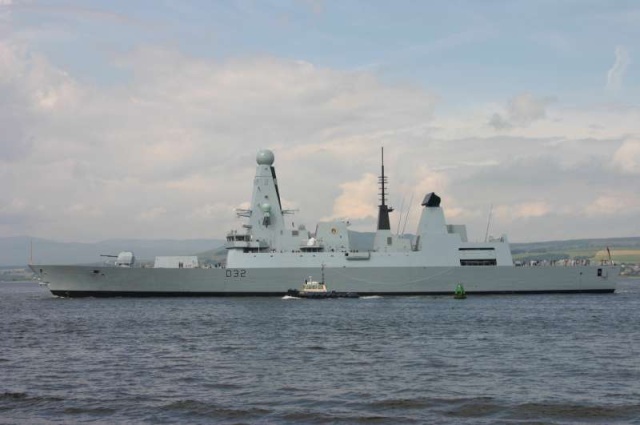 The Type 45 destroyers are the larger and more powerful replacement for the existing Type 42s. 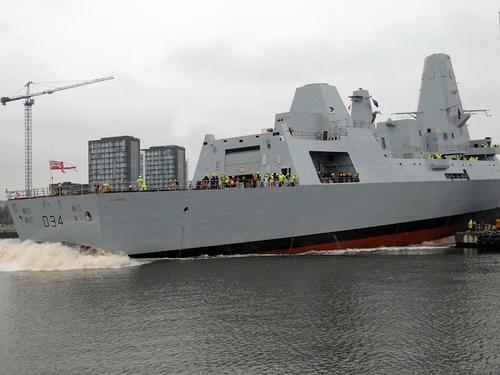 The destroyer will carry the world-leading PAAMS system (Principal Anti-Air Missile System) which is capable of defending a Type 45 and ships in its company from multiple attacks by the most sophisticated anti-ship missiles. 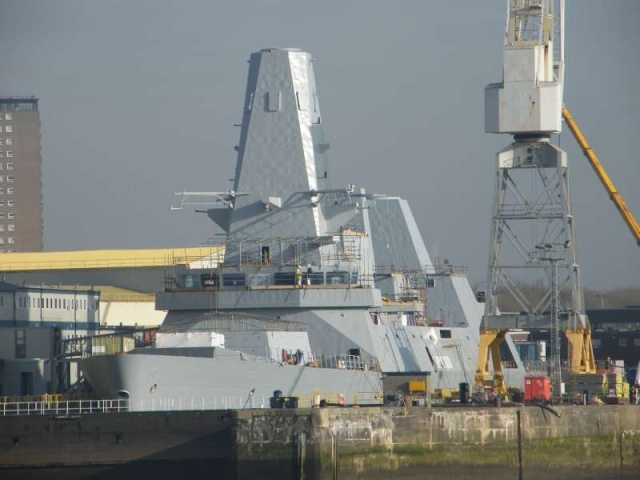 “The new Type 45 Destroyers - such as Diamond - will be the most powerful destroyers ever built for the Royal Navy. “We are in the middle of the biggest shipbuilding programme for the Royal Navy decades and today’s launch of Diamond demonstrates the scale of that investment. 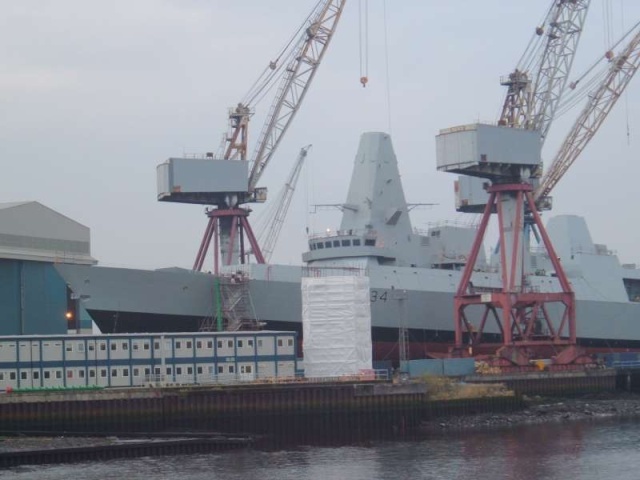 “This is an important day for the Govan shipyard, the Royal Navy, and indeed the UK, and is a tribute to the hard work of everyone involved in this project. “The Type 45 destroyers will be powerful and versatile ships, capable of undertaking a wide range of military tasks. They are based on first-class innovation and engineering, which will set new standards in air defence and will ensure that the Royal Navy remains at the forefront of the world’s navies. As well as providing air defence over a wide area, including for the future aircraft carrier, the Type 45 will be able to conduct a wide variety of other operations. They will be able to carry up to 60 Royal Marines Commandos and their equipment, support Special Forces operations, and operate a Chinook sized helicopter from the flight deck. The size of the ship will also allow accommodation standards to be better than in previous classes. Diamond was named and launched by the Lady Sponsor Mrs Suzie Johns, wife of Vice Admiral Adrian Johns CBE, the Navy’s Second Sea Lord. The event was followed by an aerial search and rescue display by a Royal Navy Sea King helicopter and a firework display. Type 45 Diamond with Commander Paddy Munns who will be the senior Naval Officer responsible for Diamond. 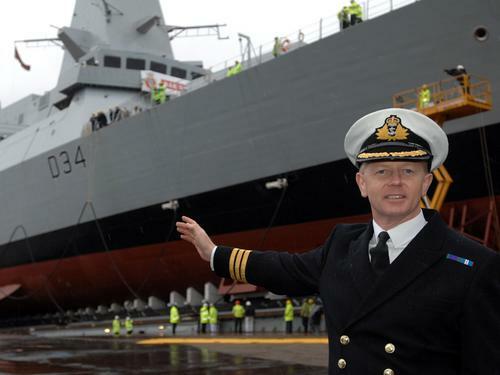 The Royal Navy’s newest and most powerful Type 45 destroyer - Diamond - was today launched from BAE’s shipyard at Govan, on the Clyde. 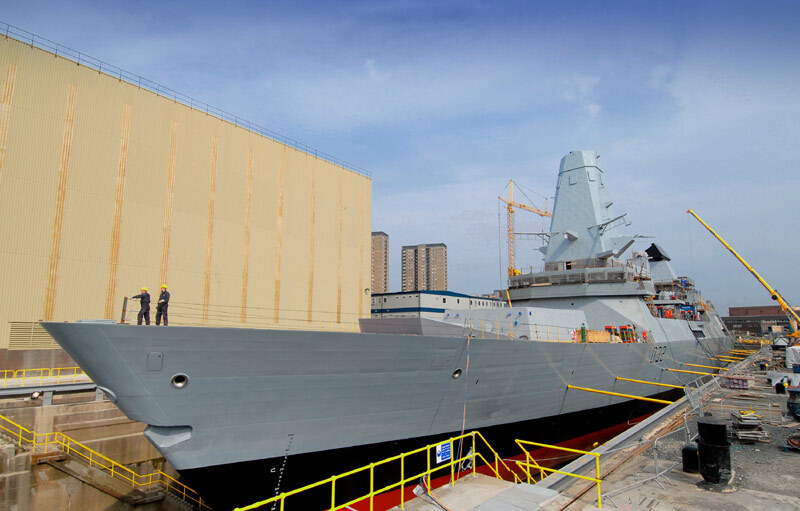 A short video showing the launch of HMS Diamond, the third Type 45 destroyer to be launched by BAE Systems on the Clyde. 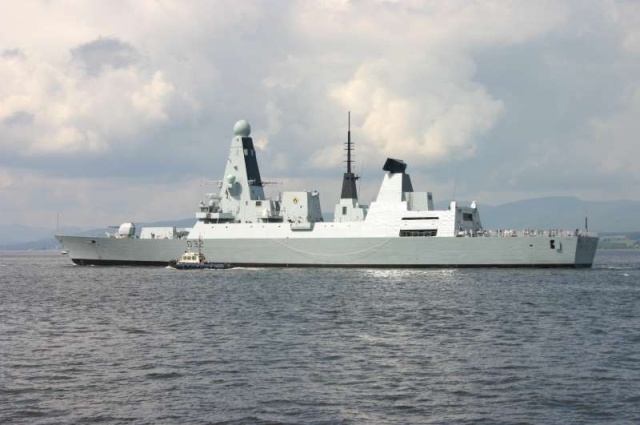 The Channel Island of Guernsey is to be affiliated with Daring, one of the Royal Navy's most advanced new air defence warships, it has been announced today, Wednesday 30 January 2008. 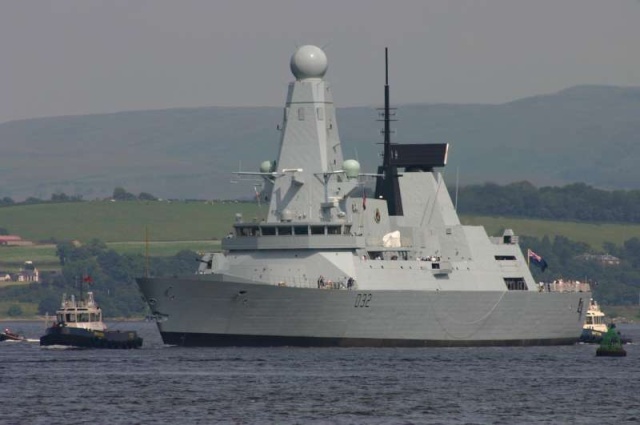 The Island's Chief Minister, Deputy Mike Torode, will reveal to the States of Deliberation and to the Island at the January States Meeting that the first of class of the new Type 45 destroyer, Daring, is to become 'Guernsey's ship' when it enters service with the Navy in 2009. All ships and submarines of the Royal Navy are affiliated to different towns, cities and regions. This strengthens Royal Naval ties with important communities, including organisations such as naval associations, youth groups, charities and other organisations. 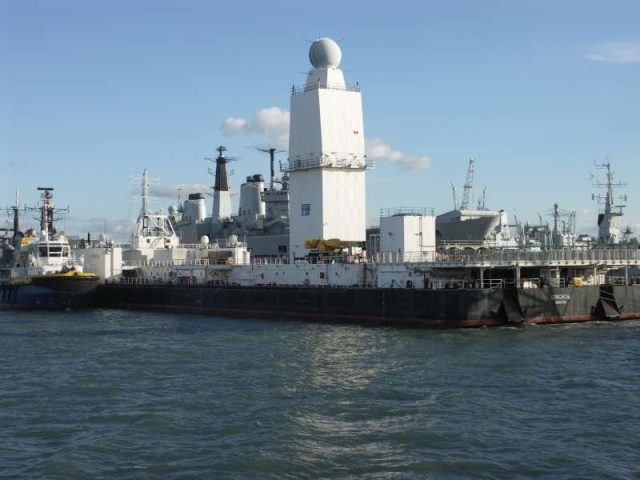 It is usual for Royal Naval vessels to enjoy a dual affiliation nowadays and Daring will be affiliated with the City of Birmingham as well as Guernsey. 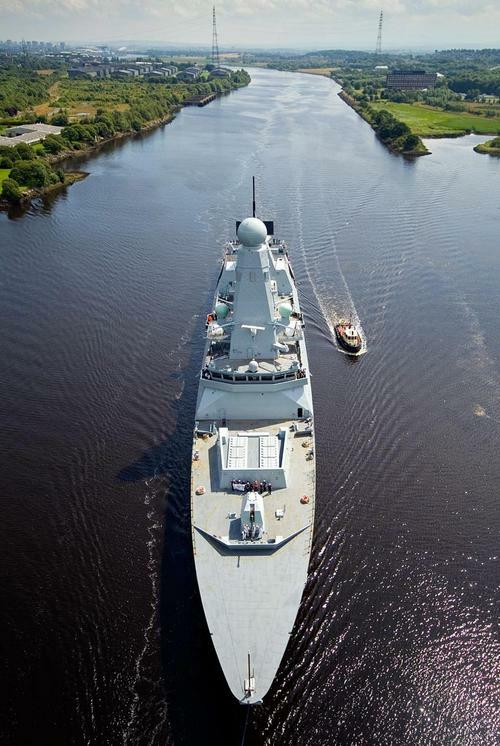 Daring belongs to the most powerful destroyer class ever built in the UK, the Type 45 air defence destroyer. She will be equipped with a state of the art air defence system which will be able to track and destroy a target the size of a cricket ball traveling three times the speed of sound. Over 150m long and displacing almost 8,000 tonnes, the size of a World War II cruiser, she will have a crew of 190 and a range of 7,000 nautical miles. Together with her five sister ships, Daring is designed to be a flexible multi-role vessel able to carry out a variety of tasks across the globe, from air defence to humanitarian and anti-piracy roles. Her affiliation announcement comes almost two years since she was launched and over a year before HMS Daring will be commissioned in 2009. "When Daring began her sea trials last year, she was quite simply superb – tremendous acceleration, manoeuvrability and stopping power. Both the Royal Navy and the ship builder were completely bowled over by her performance. I am looking forward to this affiliation enabling us together to forge new links between our service people and the community in Guernsey." "Guernsey has close historic connections with the Royal Navy, and many islanders over the centuries have served with distinction in that Service. The Island community, therefore, knows better than most about the importance of the Royal Navy in today's uncertain world. In light of this, I wish the affiliation every success and will be very interested to see HMS Daring and to meet her ship's company in due course. I know from personal experience that the people of Guernsey will give Daring a warm welcome whenever she is able to visit." "Our Island has always enjoyed a close relationship with all the armed forces, so I am delighted that the Royal Navy is continuing its long association with Guernsey and its people through this affiliation with HMS Daring. It is a special privilege for Guernsey to be affiliated with this state-of-the-art warship and I am grateful to Lord Admiral Sir Jonathan Band KCB, Chief of Naval Staff and First Sea Lord, for offering this opportunity to Guernsey. 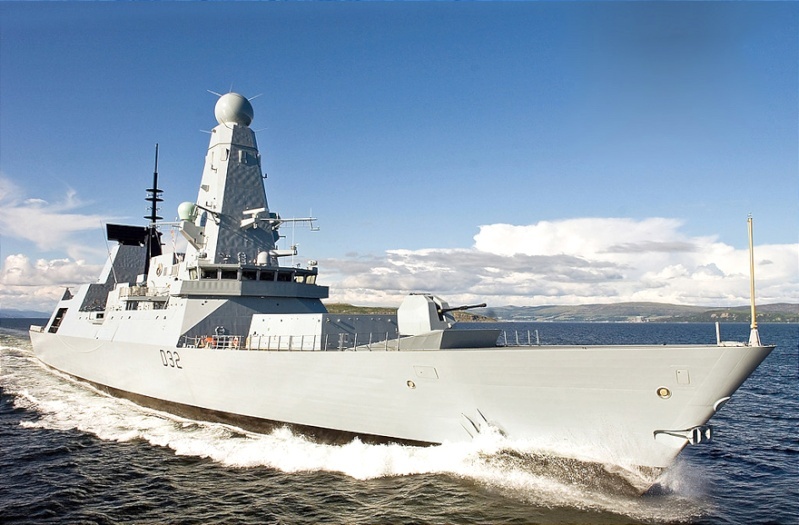 We will be pleased to welcome HMS Daring and her ship's company to the Island in due course." "I am looking forward to seeing HMS Daring when she makes her first visit to her newly adopted home and I am thrilled that by announcing this affiliation we can celebrate an important development in our shared history." Daring is the seventh Royal Navy vessel to bear the name. The last Daring was a 2,800 tonne destroyer, built by Swan Hunter and launched in 1949. 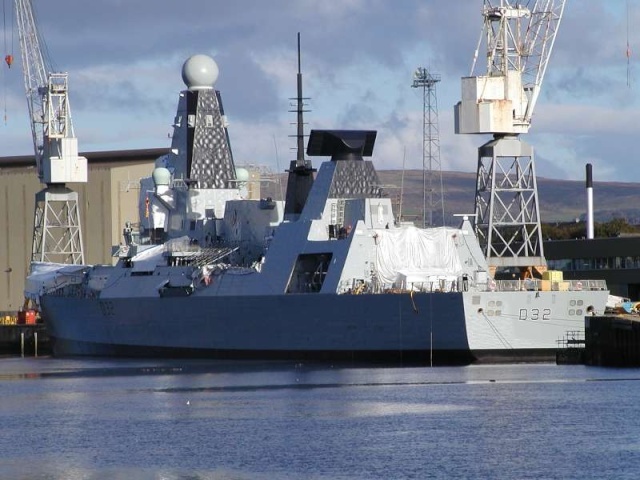 As with all Navy warships, Daring will not officially be given its HMS prefix until receiving its first commission in 2009. HMS Daring (D 32) seen at her builders in Glasgow on the 18th February 2008. HMS Dauntless (D 33) seen at her builders in Glasgow on the 18th February 2008. HMS Diamond (D 34) seen at her builders in Glasgow on the 18th February 2008. The Type 45 destroyer Daring did a bit of showing off yesterday between islands of Arran and Bute for the benefit of a host of journalists, many of them (whisper it) of the distinctly anorak-ish nature. For staff from Jane’s Defence Weekly, Warships International Fleet Review and, of course, Navy News, is seemed as if Christmas had come early in the warm May Day sunshine. But then, under such expert eyes, Daring had to perform – and perform she did. Zero to 27 knots in two minutes, mesmerizing figure-of-eight turns that left the decks 14 degrees from horizontal, and then a breathtaking standstill stop in just five and a half lengths. Not only that – she’s big. At 7,350 tonnes she’s twice as big as the Type 23s and Type 42s. And, mind blowing fact, she can detect and take out a cricket ball travelling at twice the speed of sound. She is the first front-line warship to use all-electric propulsion and her gas turbines produce 47MW of electricity, enough to power 70,000 homes – or the City of Dundee. Other journalists on board were from the Independent on Sunday, the Mail on Sunday, ITN and the Press Association. They had to be dragged off. Commander David Shutts, who has been with Daring from the start, said: “She is just simply a marvellous ship. As far as air defence goes, I would say she is the best in the world. The Royal Navy’s latest air defence missile demonstrated its prowess when it scored a direct hit on a sub-sonic target during trials in the Mediterranean. 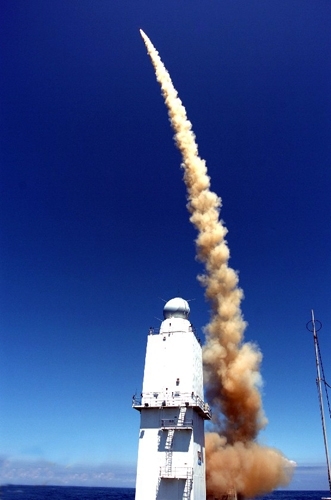 The PAAMS air defence system (Principal Anti-Air Missile System) launched a missile at over 3045 mph (mach 4) off the French coast on 4 June. It achieved a direct hit on a Mirach target simulating an aircraft travelling at 450 mph and at a 10km altitude. The highly sophisticated system has been designed to allow the new Type 45 Destroyer to defend the fleet against anti-ship missiles approaching from any direction and at supersonic speeds. Dave Twitchin, MOD Director of Destroyers, said: “The first firing was a tense moment, and the culmination of much innovation and development which made the direct hit all the more exciting. The PAAMS system, which has been developed by MBDA, will defend the fleet against attack from both aircraft and multiple sea-skimming supersonic missiles. Integral to PAAMS is the Sampson Multi Function Radar which tracks targets and directs missiles towards them. This element is a bespoke design developed by BAE Systems to meet the Royal Navy’s very specific requirements. The trials were conducted from a 12,000 tonne converted barge which carried a full replica of the air defence equipment the new Type 45 destroyers will carry, include long range and missile directing radars, a combat control centre and missiles in their vertical launcher silos.